It's not uncommon to offer a reward to people for subscribing to your Mailchimp list. More often than not, this is done by just uploading file to your server and hoping no-one shares the URL. But what if you want to make sure that the people who access your download file are actually subscribed to your Mailchimp list? Download Monitor is a great plugin to offer downloads to your site visitors. Of course you could just upload a file to your site and then share the links, but using the Download Monitor plugin makes things a lot easier. Manage your downloads using the familiar WordPress interface; just like posts. Keep track of download statistics. Categorise and tag your downloads. Display download links in your posts and pages using simple-to-use shortcodes. We are big fans of the Download Monitor plugin and thought it would be cool to use a Mailchimp list as a prerequisite. 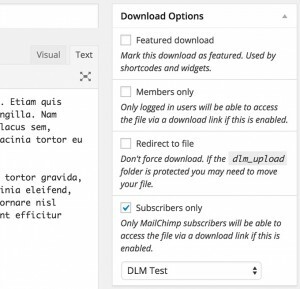 That means that visitors need to be subscribed to the selected Mailchimp list before they can access a file download. We got in touch with Barry Kooij, the developer of Download Monitor. After a few months of collaboration, we are now proud to present to you the Mailchimp Lock add-on for Download Monitor. After installing and activating the plugin, you'll have an extra option for your downloads where you can select a Mailchimp list. You can get the Mailchimp Lock add-on from the Download Monitor site. As always; if you have any questions, we're happy to help!